The following is the response of SCOUT eh! Chair, Mike Reid, to Leader editor, Ross Francis following his refusal to accept our ad. It is with a deep sense of embarrassment that I have received the news of your unwillingness to consider advertising from SCOUT eh! "I have discussed your proposed advertisement with Ross Francis, Executive Editor of the Leader Magazine and while we recognize your group and respect its rights, we do not believe it would be appropriate to promote your group in our magazine. Therefore, we will not be able to place this ad in an upcoming issue of the Leader Magazine." The bolded italics are mine. It seems to me that there must be some misunderstanding about SCOUT eh! We are Ordinary Members of Scouts Canada that have associated ourselves for the purpose of being heard and heard in strength. We are not out to destroy Scouts Canada or what it stands for. What we do is inform the membership on issues we feel are important to them and to Scouting as a whole. 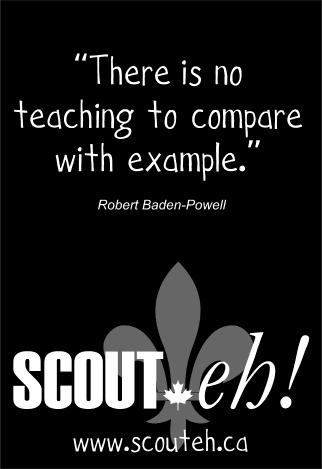 We educate with the hope that they will be able to make informed decisions as Scouters. Do we have a bias? Yes we do. That bias is only for the betterment of the association as a whole. SCOUT eh! exists because there is a need for Ordinary-members to have a forum. With that in mind, we discussed the print ads at length at our last meeting. We designed copy with a fundamental Scouting message and our web address. To preclude our Scouts Canada membership from the opportunity to become informed of different viewpoints is very un-Scout like. If the powers that be cannot stand a little introspection from their own membership then they do not deserve the responsibility that they have. It seems more and more that there is only room for members who uncritically adopt the management viewpoint. It appears more and more as if freedom of opinion, expression and association are not welcome under Scouts Canada's tent. This is why I say I am embarrassed by this whole affair. What does it mean to say that you recognize our group and respect our right? Our rights are your rights and you demean the word rights by such platitudes. In fact it is wholly "appropriate to promote our group in our magazine". Your decision is most regrettable. Download this letter as a pdf document.